emang sih RvP jago ngegolin tp sayang penampilan musim ini belon konsisten, assist-nya kbanyakan dr corner dan gol-nya jg dari penalti..juga kadang2 RvP msh suka kagok di nerima bola dan dribel-nya..tp emang gol-golnya persie (yg bukan penalti) tuh semuanya SPEKTAKULEEEEEERRRRR....!!! coba tiap pertandingan dia punya visi yg begono..pasti ai punya ARSENAL makin MANTABH!! Arsenal Football Club is delighted to announce that Robin van Persie has signed a new long-term contract with the Club. Van Persie (25), who joined the Gunners from home town club Feyenoord in 2004, was Arsenal’s leading goalscorer last season with 20 goals from his 44 overall appearances. In his five seasons with Arsenal, Van Persie, who is capable of turning a match at any time with a flourish of his left foot, has made 177 appearances for the Gunners, scoring a total of 63 goals in all competitions. The Dutch international striker, is also a regular with his national team and has scored 13 goals from his 37 appearances, already helping the Netherlands qualify for the FIFA World Cup 2010 in South Africa. Van Persie, who was an FA Cup winner with the Club in 2005, played an integral part in Arsenal’s run to the UEFA Champions League and FA Cup semi-finals last season. As well as his 11 Premier League goals, Robin scored five times in the Champions League and four in the FA Cup. Throughout the season, Robin produced many important and match winning performances, most notably scoring both goals in the 2-1 league win at Chelsea last November. Robin van Persie added: “I’m so happy to have signed a new long term contract. I’ve been at the Club for five years now and there really is a great feeling here at Arsenal. We have a top class manager, a squad full of superb young players, a world class stadium and brilliant supporters. 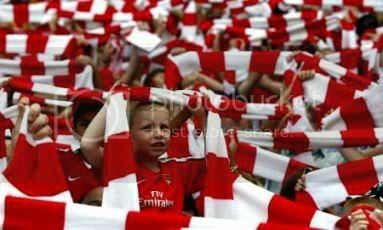 Arsenal Football Club has a very bright future and I want to be part of it. "My heart is with Arsenal and I just can’t picture myself in a different shirt. I just can’t see it now because I love this Club so much. If you look at the last five years, look at the steps I have made every season, if you look at the support the Boss and the whole Club gave me, the fans gave me, my team mates gave me – this is the right decision." Everyone at Arsenal Football Club is looking forward to Robin’s continued contribution in the forthcoming years. congrats buat van persie... musim depan jadi top skorer ya..
*gw doain, smoga video centurions nya dia cpt keluar...amien. Yesss!! finally!! Congrats RvP !! iih bajunya gak pernah di cuci dong tan. akhirnya berita paling ditunggu minggu ini di arsenal.com keluar juga ... congratz buat RvP ! cacing, kalo ngeliat goal recordnya ... mungkin dia bakal jd centurion 2-3 musim lagi. Yg terpenting dia g sering kena cidera2 lg, gw yakin pasti video centurion nya cpt keluar...amien.